An old tradition for French Canadian families around the Christmas Holiday--usually Christmas Eve-- includes tourtiere pie. Usually made with ground pork or other game meat, I used grass-fed ground beef & ground pork. It is a very simple recipe and super quick if you buy the crusts and line your own pans. I doubled the recipe and used about 1/2 tsp of the nutmeg and sage per pie. Don't skip the 30 minutes of simmering! The gourmet flavor of the end result is going to surprise you. RICH an Flavorful! Brown pork in skillet. drain off excess fat. add remaining ingredients except (and as if we didn't know any better) the pie crust. Simmer 30 minutes, stirring occasionally. Line pie plate with half of crust. Turn mixture into crust. Adjust top crust and seal. Cut slits in top to permit escape of steam. Bake at 400 degrees for 35 minutes or till crust is a golden brown. We had ours with roasted turnips and broccoli raab braised in rice wine. Terrific meal tonight! Enjoying the weekend cooking up all the veggies that need immediate attention. They have been so patient with me! I've been wanting some curried beef but wanted to use up some fresh cabbage. 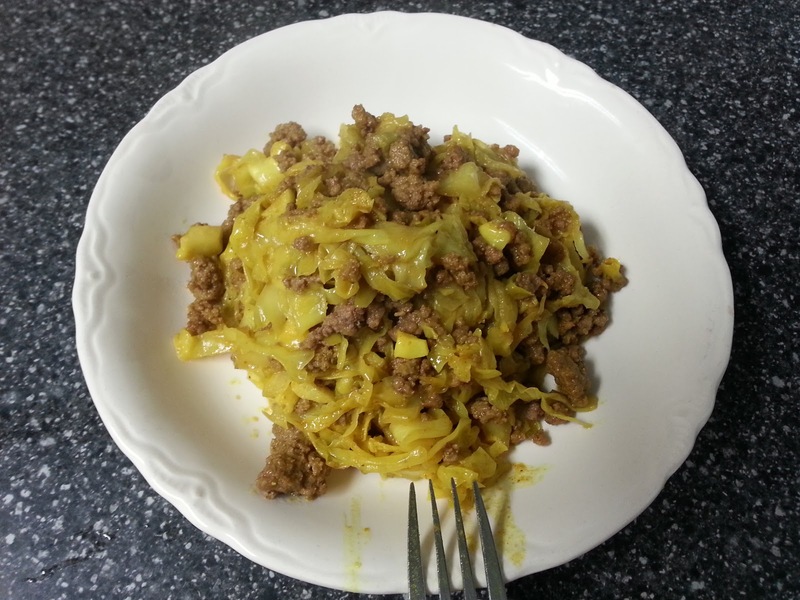 When I googled curry and cabbage this magnificent recipe came up and showed the combination works great! All I did was add cooked, grass-fed ground beef towards the end. I didn't have any shallots and I substituted coconut oil for the vegetable oil. It turned out unbelievably tasty and I got my curried beef fix in just a few easy steps. It all happened so fast that I managed to get only a few scrumptious photos of the process. All measurements are approximate. In a blender, whip up a dressing of organic extra virgin olive oil (1 cup), apple cider vinegar (max 1 - 2 tsp: "less is better"), red balsalmic vinegar (2 TB), fresh squeezed lemon juice (2 - 3 TB), grey sea salt (1 tsp), fresh ground pepper (1/4 tsp), and a clove (or two) of garlic. This dressing will keep well when refrigerated for 2 - 3 weeks. Here's how I did it! Note: I forgot the red balsalmic this time around and it isn't as good without it. Had some leftover tatsoi and needed some protein for breakfast... here's how I did it! Step by step amazing eggs with tatsoi! These are one of my kids favorites! I was ecstatic to find kale on the market last week, so I promptly ordered two bunches and then had to wait until Friday. I hate waiting, especially when it has to do with food I love to prepare and eat! This recipe is adapted from one I found on Food Network. Keep the leftovers for great all around seasoning. Or sprinkle the kale with your seasoning of choice. Roast at 400 degrees for 20 minutes flipping once, or until they are crispy but not burnt. Then make a second batch…they won’t last long!